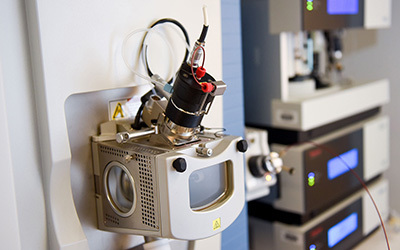 Researchers can now schedule access to mass spectrometry instrumentation through an online system offered by METRIC, the university’s new Molecular Education, Technology, and Research Innovation Center. Nuclear magnetic resonance and X-ray crystallography instruments will be fully integrated into the system this summer. It’s no surprise that 99.9 percent of scientific papers require some form of measurement for data collection. However, it’s expensive to buy, maintain and update scientific instruments, especially for individual departments or research faculty. Researchers can now access mass spectrometry instruments via METRIC. METRIC aims to alleviate this economic burden by making state-of-the-art, scientific infrastructure and instrumentation such as mass spectrometry, magnetic resonance and X-ray crystallography available to all departments and faculty. METRIC allows departments to combine resources for updating and maintaining research equipment and lab space. One of the biggest benefits from merging these facilities will come from instrument maintenance contracts that will result in near real time repairs. Another benefit of combining resources is that METRIC can run fewer instruments at a higher efficiency and help NC State recruit top-notch faculty and graduate students with a new showcase facility. METRIC also automates instrument billing, safety training and measurement data storage through MENDIX, an online platform. Previously, these tasks were all performed manually, and tracking safety training was extremely difficult. The METRIC team. Back row, from left: Peter Thompson, Paul Swartz, Dave Muddiman, Roger Sommer, Joe Barycki, Allison Stewart. Front row, from left: Jennifer Sun, Taufika Islam Williams, Danielle Lehman. Not pictured: Jeff Enders. For dye chemist Nelson Vinueza, assistant professor in the Department of Textile Engineering, Chemistry and Science, METRIC will be a tremendous asset for his research on the Max Weaver Dye Library. The library, donated to NC State by Eastman Chemical, contains over 98,000 dyes housed in the College of Textiles. These dyes are stored in vials with hand-drawn labels. Vinueza will characterize these dyes with the instruments at METRIC to confirm that their chemical structures match their labels. Then collaborators may begin testing dyes for a variety of applications ranging from medical stains to solar cell design.